One of the iconic images from the Japanese horror film Ringu (and its American remake The Ring) is a view from the bottom of a deep, dark well: a circular patch of sky occupying the centre of the frame, the rest of the screen dark. 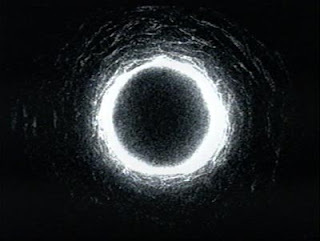 When the mouth of the well is covered with a makeshift lid, the image becomes the sinister glowing “ring” of the film’s title. 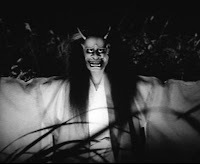 I’m not sure about this, but the patch-of-sky view could be inspired by a similar shot in Kaneto Shindo’s creepy 1964 film Onibaba (The Devil Woman), which I watched on one of those fabulous Criterion Collection DVDs a while ago. The shot comes very early in the film. The first scene is an overhead view of a windy grassland, the reeds – more than six feet high – swaying in the breeze. The camera moves closer to show us a large pit in the ground and the next shot is from deep inside the hole, looking up. Then the film’s opening credits begin, accompanied by a strident, percussive music score. The pit's existence is known only to a middle-aged woman and her daughter-in-law, who live in squalid conditions in this large marshland. Struggling to make ends meet (this is medieval Japan and the son/husband is away fighting in an army), the two women murder wounded Samurai who stagger into the grass looking for shelter, dump the bodies in the hole, and then trade the armour for meagre rations of food. Meanwhile they also get by with killing rats, dogs and whatever other creatures they can get their hands on, and generally live like wild animals themselves. Things change when a neighbour, a man named Hachi, starts making advances on the daughter-in-law. Their clandestine relationship terrifies the older woman, who fears being left to fend for herself. She tries to dissuade them by talking about hellfire and divine punishment for carnal sins, but to no avail. Then she gets her hands on a demon mask and an idea presents itself. On the face of it, the deep hole, into which the bodies of the murdered men are thrown, seems like an obvious sexual symbol – implying the woman as predator. But the two protagonists aren’t evil or insane. They are doing what they need to do to survive. The grassland – and the little hut in its centre – is their home, and outside its borders great battles are taking place: kings are trying to usurp each others’ territories, men are dying by the thousands, villages are being pillaged and burned to the ground, once-proud warriors are fleeing in fear. (Though the story is set in roughly the same period as Kurosawa’s The Seven Samurai, there is no place here for the codes of honour that were central to that film; chaos and degradation rule.) There are rumours that a black sun rose on a nearby land a few days earlier. In a world gone so rotten, what’s so wrong with hastening the deaths of a few men who are doomed anyway? Despite the film’s title, there are no “devil women” here, only human beings – a point underlined by the unforgettable final scene, a series of jump-cuts punctuated by a cry of anguish (I can’t reveal more, you have to watch the film for the spine-chilling context). More than anything else, the scene leaves you with a sense of sadness for wasted lives; for people struggling to get by in the face of hunger and loneliness. “Take off your mask,” whispers the old woman to a Samurai who has just told her that he has a beautiful face underneath the mask he is wearing, “I’ve never seen anything really beautiful.” The words open a window to a lifetime of deprivation, but they don’t prevent us from seeing that the mask is terrifyingly beautiful itself. It’s also just as impassive as the grassland where this human drama plays out. Haven't seen this but the review reminds me so much of another Japanese film of 1964 'Woman in the dunes' http://www.imdb.com/title/tt0058625/ which happens to be one of the best "horror" film I've seen. Highly highly recommended. God bless the Criterion Collection. Its like a guiding light. 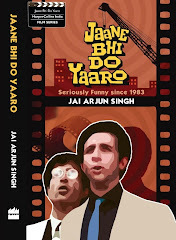 Would be interesting to see them restore movies made here in India. The closest they've come is Monsoon Wedding and Renoir's The River (with a young Satyajit Ray as AD). pseudonym: yes, there are intriguing similarities with Woman in the Dunes (I didn't realise that film was released in the same year btw). The theme of the outcaste, the role of sexuality...and the grass in this film is just as central to the overall mood as the sand was in Woman in the Dunes. a fan apart: prints of old Indian films (including many classics of "parallel cinema"/the Indian New Wave) are in such a poor state, it really is a pity. I got a very rare DVD of Sathyu's Garam Hawa the other day - the print is awful. a fan apart: I digress. But Satyajit Ray wasn't the Asst Director in The River. His name isn't mentioned in the film's title credits. As per most accounts, he just helped Renoir choose the locations for the film. Shrikanth: My bad. You're quite right; Ray apparently assisted Renoir, but he wasn't assistant director. The black and white was actually done purposefully, as the director explains in the extras, to get the right funneling of the visual impressions, so they resonate with the idea of the human heart, now calm, now turbulent, shown by the swaying grass. Some of the scenes are superb. When the old woman spies on the young woman's love-making, her first reaction is of this deep sense of deprivation, and she sobs bitterly clutching a dried up tree, mourning her old age.